Family history repeated itself Wednesday at Kincaid Park. Racing on trails they grew up on, the brother-sister act of Caitlin and Scott Patterson captured national championships at the U.S. Cross Country championships – victories that came exactly two years after they pulled off the same feat in Michigan. Both won by significant margins – Scott took the 15-kilometer freestyle title by more than 55 seconds, and Caitlin claimed the 10K freestyle crown by nearly 20 seconds. It was the third national championship for each, and the first time the South High graduates reigned on the same day on home snow. "My sister won this morning, I won this afternoon – it's a good family day," Scott said amid falling snow that made for challenging conditions. A day after record-high temperatures turned much of Kincaid into a skating rink, the arrival of wet snow transformed everything. 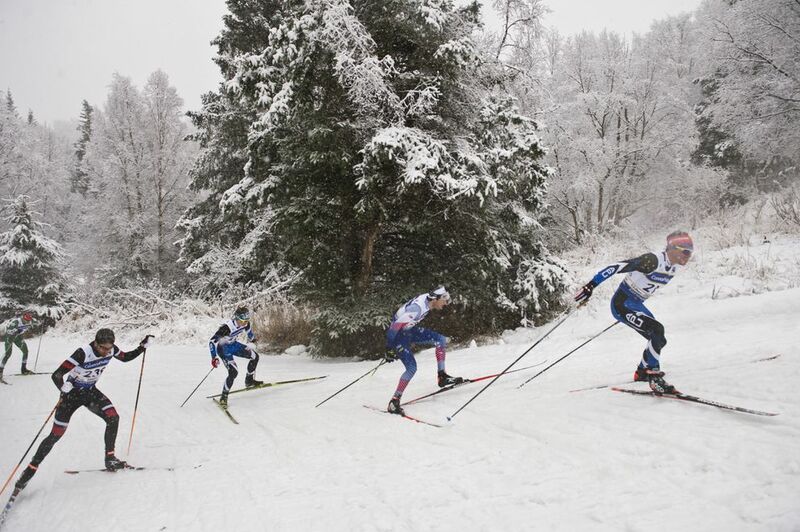 Fast, icy trails turned into slow, mushy trails, making for tough going on a 2.5-kilometer loop that the men skied six times in the 15-kilometer freestyle race and the women skied four times in the 10K freestyle. Gus Schumacher of Anchorage, the top junior-level man, said slush was 3 inches deep on the gong hill, the slope near the Kincaid stadium that men had to climb 12 times during their six-lap race. "Going up the hill was like swimming in powder," said University of Colorado skier Petter Reistad. Compounding everything was nonstop snow that was nearly as wet as rain thanks to temperatures that hovered around the freezing point. Visibility was limited, and racers with goggles or glasses had a heck of a time. So did people craving waffles – the Waffles and Whatnot food truck that planned to spend the morning parked outside the Kincaid chalet was a no-show after it drove off the road. "I noticed a lot of people started the race with glasses on and then threw them off," said Hailey Swirbul, a UAA sophomore who was the top junior woman. "The downhills were the hardest part because the snow is hitting your eyes and it stings." "My glasses were fogging up and icing up," said Hunter Wonders of Anchorage. "I was trying to do the windshield-wiper thing with my hand on the downhills," said Caitlin Patterson. "It's a good thing I know these downhills." The Pattersons grew up racing for the Alaska Winter Stars and did their high school racing at South High. Both were All-America skiers at the University of Vermont, but they parted ways after college – Scott, 25, returned to Anchorage to join the Alaska Pacific University ski team, and Caitlin, 27, stayed in Vermont to train with the Craftsbury Green Racing Project. Both are Olympic hopefuls, and their victories Wednesday could help get them to Pyeongchang, South Korea. Though nothing is official yet, the U.S. Ski Team is likely to take a big team to the Olympics – Scott Patterson said as many as nine men and nine women could go. The national championships at Kincaid are doubling as the Olympic Trials, although it's a good bet that less than half of the team will be decided in Anchorage. 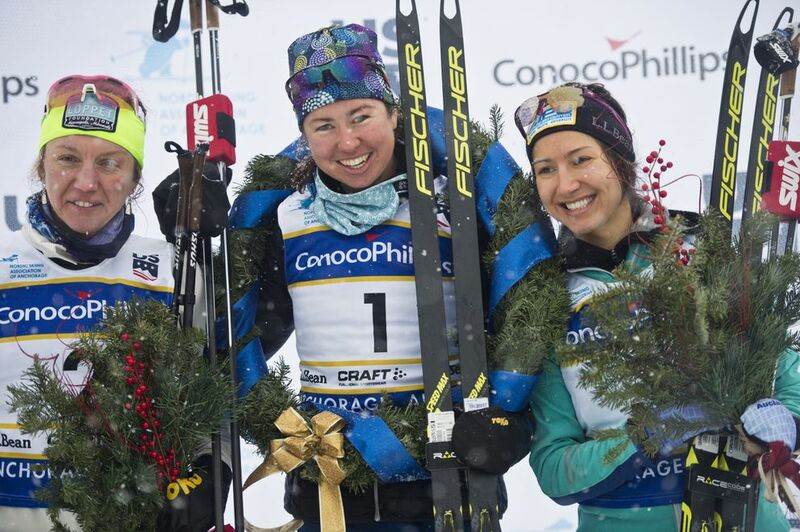 If Patterson's guess on team size is correct, that means only three women racing in Anchorage this week have a chance to ski their way onto the Olympic team. "I'm optimistic there'll be a few women selected from these trials," Caitlin Patterson said. "… They already told us they're not picking any sprinters, but I'm optimistic there may be some distance spots they want to fill." That's good for Patterson, who is at her best in distance races. She owns 10 medals from the national championships, and nine are in distance events – including all three of her national championships (Wednesday's 10K and 2016 titles in the 20K freestyle and 10K classic). Patterson's time of 27:09.1 put her well ahead of second-place Caitlin Gregg of Minnesota (27:28.8). Chelsea Holmes of Girdwood was third in 27:33.5, giving APU two women on the podium. Like his sister, Scott Patterson is a distance doyen – the longer the race, the better he gets. All three of his national titles have come in distance events (Wednesday's 15K freestyle, the 2017 50K freestyle and the 2016 15K classic). Patterson started the season on the World Cup tour and hoped to do well enough to climb into the top 50 overall rankings and clinch an Olympic spot that way. And while he had some decent results and drew praise from his U.S. Ski Team coaches in Europe, he didn't do well enough to crack the World Cup rankings. So he's back in Anchorage, hoping to ski his way onto the Olympic team here. Patterson thinks three men have already secured spots on the Olympic team, and all of them are still in Europe. "I'm kind of next in line, I think," he said. "… I'm definitely feeling a lot of pressure, but I feel like I'm skiing with a lot of confidence too." Winning on Wednesday helped. Winning big may have helped even more. Patterson finished in 36 minutes, 33.7 seconds, well ahead of runner-up Noah Hoffman of Colorado, a 2014 Olympian (37:29.0). Third place went Minnesota's Matt Liebsch (37:50.3). In sixth place was Schumacher, a 17-year-old Alaska Winter Stars skier who finished in 38:01.4, nearly four seconds ahead of seventh-place Brian Gregg, a 2014 Olympian. The performance was the most impressive of the day by a skier not named Patterson. "Sixth was sweet," said Schumacher, who said he came into the race series hoping for a top-10 finish in one of the four races. Schumacher was around 10th place after his fifth lap, so he put the hammer down for his final 2.5 kilometers. "I felt like I had enough in the tank to really push that last lap," he said. Schumacher led a strong showing by Alaska's junior racers. He and Wonders finished 1-3 in the men's race (Wonders was 21st overall), and Swirbul and Hannah Halvorsen of APU were 1-2 (Halvorsen placed 14th overall). Five of the top 10 women have Alaska ties – Patterson, Holmes, fourth-place Rosie Frankowski of APU, Swirbul and ninth-place Becca Rorabaugh of APU. In the men's race, Tyler Kornfield of APU finished 14th to give Alaska three skiers in the top 15 of the men's race.